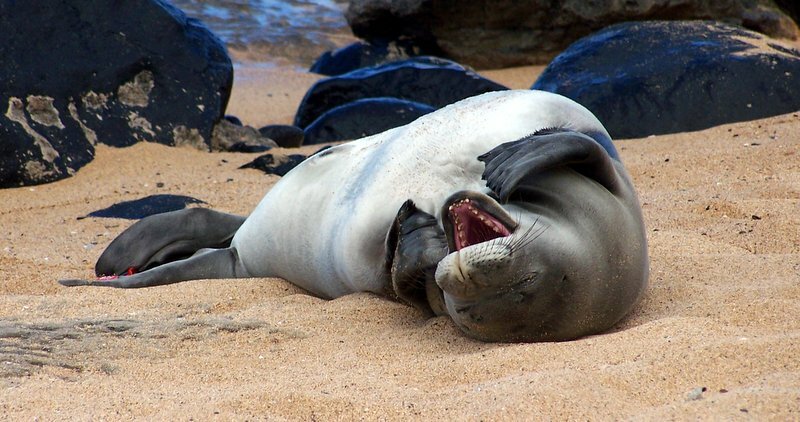 Banner pupping year on Kauai – 5 pups! 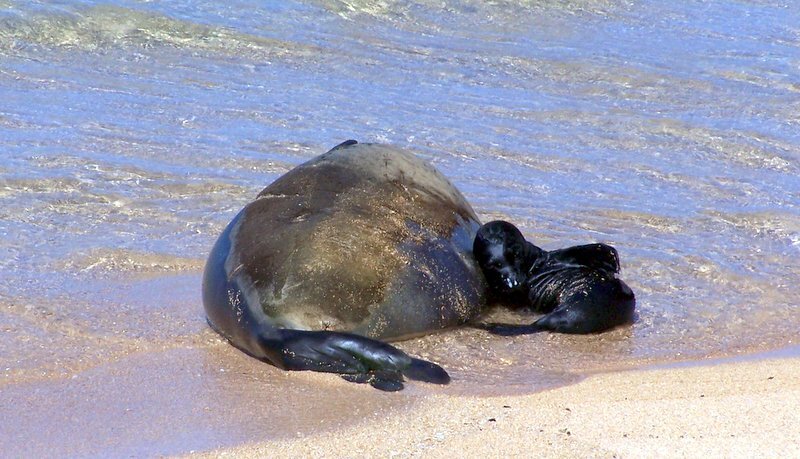 In addition to the previous pups reported (PK1, PK2 and PK3) two more pups were born on the north shore of Kauai. RH58, a well known and very successful mother gave birth to PK4 on June 28th. RK28, another proven mother gave birth to PK5 on July 16th. 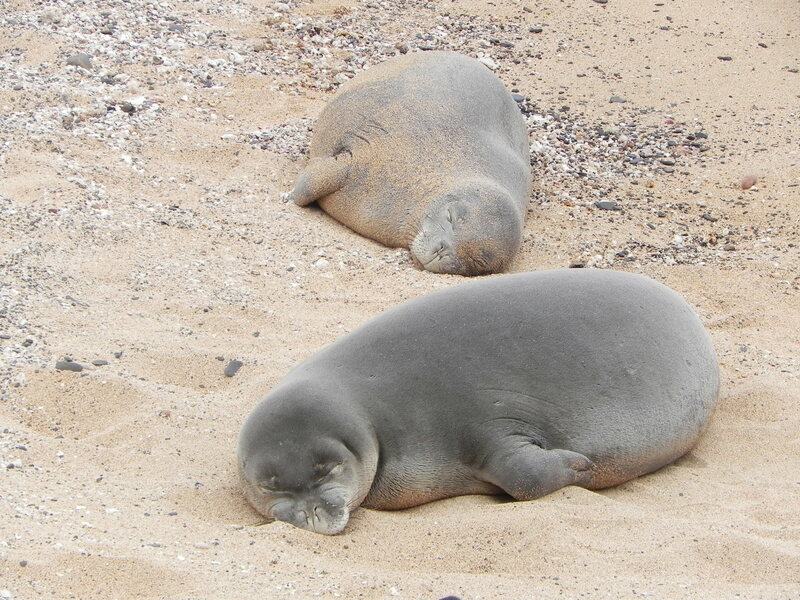 Pups only spend around 40 days with their mothers, during which they gain massive amounts of weight from nursing. The typical pup is born at 35 pounds and gains between 100-150 pounds in a short 5-6 weeks! The mothers fast during this time and convert blubber into very rich milk (twice the calories of heavy whipping cream). RF30 female. Photo credit: Thomton. RF58 female. Photo credit: Langley. Off-Leash Dogs: Tragically, PK5 was killed by stray dogs when he was only two weeks old. The incident occurred during the night and was therefore not witnessed by our diligent pup-sitters. 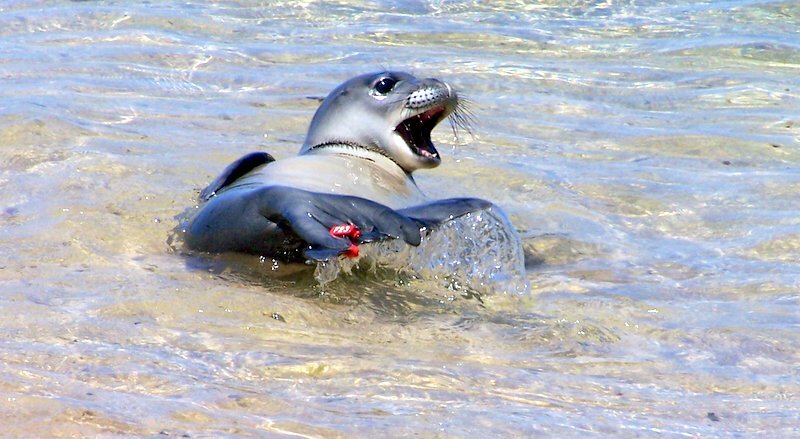 Tracks, blood, and injuries to four other seals, including PK5’s mom, indicated that the mother seals did their best to protect their pups. PK4 (now tagged RF58) had over 60 bite marks on her body and developed major abscesses around her neck. She immediately received medical attention and disease screening by a NOAA veterinary team, and fortunately healed quickly. Currently she is doing well and learning how to be an independent juvenile seal. Permanent neck scars will help us identify her, but pose no risk to her survival. 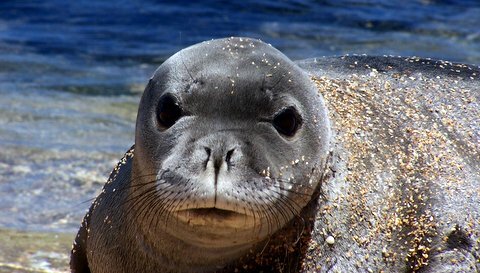 This was the first known monk seal death caused by a dog and a warning to all of us that we must keep our dogs on leashes (it is State law on all beaches) and strongly encourage everyone else to do the same.